string(49) "J'ai vu tuer Ben Barka - I Saw Ben Barka Murdered"
Plot: Serge Le Péron's I Saw Ben Barka Killed/J'ai vu tuer Ben Barka has Jean-Pierre Léaud playing French Forties cult director Georges Franju, and an actress called Josiane Balasko as Marguerite Duras. They're contacted by a con-artist, ex-con and would-be artist-intellectual named Georges Figon (French film everyman Charles Berling), who's been in turn contacted by mysterious others to start a project: a film about French colonialism, which will use exiled Moroccan revolutionary leader Mehdi Ben Barka (Simon Abkarian) as its historical adviser. Figon (also a historical figure, if of less note) has no particular business being involved in such a thing, but his handlers knew he would want to: he's out for the main chance and figures to get rich and make his actress girlfriend famous by doing it. The year is 1965. Figon meets with Ben Barka briefly in a hotel in Egypt with men he doesn't realize are intelligence agents (one of them played by Matthieu Amalric). 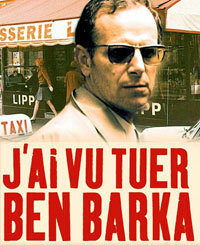 Ben Barka agrees to work on the film. Later Ben Barka comes to Paris to consult, but just before his first meeting is intercepted on the street along with a young Moroccan intellectual whose help he's soliciting for the project. And that's the end of Ben Barka. Later in the day Figon's there, cooperating, when Ben Barka is upstairs somewhere outside Paris being tortured; but flexible though he may be, Figon comes down too. He was only a pawn in the game. We see actual footage of then President Charles De Gaulle at a mega-press conference denying any French government knowledge of or involvement in the wacking of Ben Barka. Shots of Figon's body in a pool of blood on the floor (neatly suited as throughout) bookend the piece. He's dead, but he narrates the movie  post-death. The aim of this nourish fictionalization is to dot i's and cross t's on a government assassination that could be considered an important footnote on the history of French colonialism. Unfortunately the noir hints only point up J'ai vu tuer's colorless generic quality. It never comes up with explanations of the deeper motives of the events it spotlights (why Ben Barka? Why now?) or gathers much real momentum, Figon hogs the screen while remaining a colorless shill. Actor Abkarian endows Ben Barka with dignity: he's like a North African Yves Montand (one remembers Montand's aging revolutionary in Resnais' 1966 La guerre est finie). But Ben Barka is only the indirect focus of the film, a backdrop for Figon's story.